Instructions: Cut a piece of Coconut White cardstock 10" x 7", score at 5" along the long side and fold to create a base card of 5" x 7". Cut a piece of gold mirror card 5" x 7" and adhere to the front of the card. Cut a piece of Coconut White 4 3/4" x 6 3/4" and adhere to the front of the card. 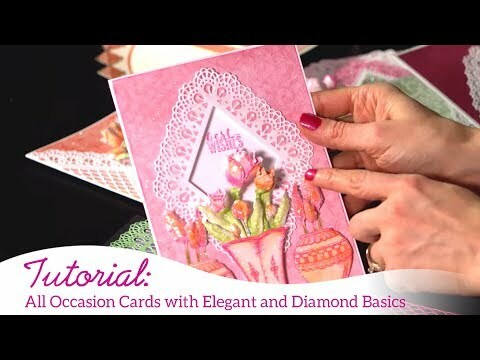 Die cut the decorative die from the HCD1-7192 Eyelet Lace Frames Die from Coconut White cardstock and add a pearl finish with the Pearl Lustre Metallic Guilding Polish and adhere to the front of the card. Die cut the lacy diamond from the HCD1-7228 Lacy Diamond die set from Coconut White cardstock and add the pearl finish with the Pearl Lustre Metallic Guilding Polish. 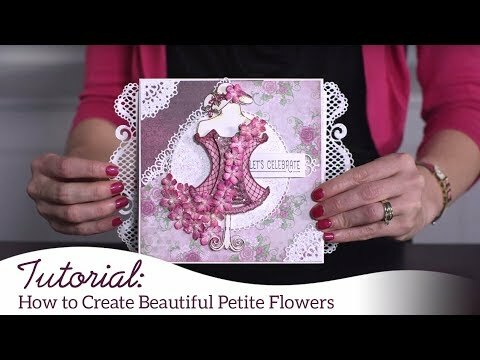 Adhere to the front of the card with foam tape. Die cut the eyelet edge diamond from the HCD1-7227 Eyelet Diamond die set and again add the pearl finish with the Pearl Lustre Metallic Guilding Polish and adhere to the front of the lacy diamond. Die cut two of the inner diamonds from the Coconut White cardstock and adhere together. Add the pearl finish with the Pearl Lustre Metallic Guilding Polish and adhere to the front of the card. Add pearls to the lacy diamond and the base decorative die as shown. Paint the cross with white gesso and when dry paint several layers of the Pearl White paint until the desired effect is achieved. Adhere to the front of the diamonds as shown. Add a pearl to the centre of the cross. Stamp the tulip images from the HCPC-3858 Tulip Time stamp set in Leaf Green ink on Iris cardstock. Colour lightly with Vivid Chartreuse ink and die cut with the coordinating die. Colour the edges and back with Vivid Chartreuse ink and then shape in the coordinating mold. Assemble and add Crystal Clear glitter using Dries Clear glue on a damp sponge. Stamp the leaf and stem images from the HCPC-3858 Tulip Time stamp set in Library Green ink on Iris cardstock, and colour in with Leaf Green and Olive Green inks before die cutting with the coordinating die. Shape and add to the tulips. Add Crystal Clear glitter to the leaves using Dries Clear glue on a damp sponge. Stamp the floral images from the HCPC-3855 Floral Fashionista Stamp set in French Ultramarine ink on Iris cardstock. Colour the centres lightly with Buttercup ink and die cut with the coordinating die. Shape using the coordinating mold and when dry pierce the centres and insert the stamens. 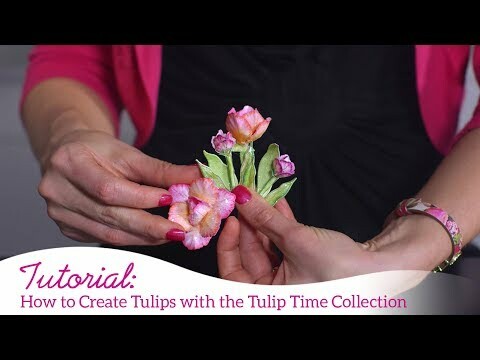 Add glue to secure the stamens and when dry add the Diamond Sprinkles glitter, trim the ends of the wires and adhere around the tulips. Stamp the fern images from the HCPC-3860 Tulip Vase & Fillers stamp set in Vivid Chartreuse ink on Iris cardstock and colour in lightly with Vivid Chartreuse and Leaf Green inks before die cutting with the coordinating die. Shape using the Deluxe Flower Shaping set and add Crystal Clear glitter to the leaves. Adhere to the back of the tulips. Add a double bow made from cream organza ribbon at the base of the flowers. Stamp the sentiment from the HCPC-3848 Cheerful Notes Sentiments stamp set in Versamark ink on Coconut White cardstock. Heat emboss with gold embossing powder and die cut with the smallest arrow die from the HCD1-7204 Arrows & Banner Die set. Die cut another arrow from gold cardstock using the second smallest banner from the HCD1-7204 Arrows & Banner Die set and adhere the sentiment on this. Trim the end and adhere under the bow as shown.